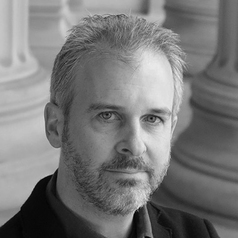 Timothy Hyde is an architectural historian whose research focuses on intersections of architecture and politics. His writings, ranging from a genealogy of mat-building, to a précis of the work of John Johansen, to an explication of Reyner Banham’s concept of the gizmo, have appeared in a number of journals including Log, Praxis, and Thresholds. Hyde is currently pursuing an extended study of entanglements between architecture and law, research that includes his book, Constitutional Modernism: Architecture and Civil Society in Cuba, 1933-1959; his essay, 'Some Evidence of Libel, Criticism, and Publicity in the Architectural Career of Sir John Soane,' published in Perspecta; and a new project on the aesthetic debates about ugliness in Great Britain in the 19th and 20th centuries. He is a founding member of the Aggregate Architectural History Collaborative and is one of the editors of the first Aggregate book, Governing by Design. He has been a MacDowell Colony Fellow and his work has been supported by grants from the Graham Foundation. Hyde received his BA from Yale University, MArch from Princeton University, and PhD from Harvard University.